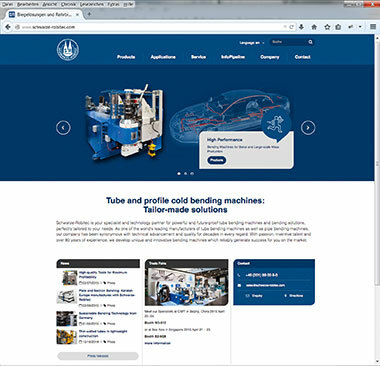 The new website of the tube bending machine manufacturer Schwarze-Robitec presents itself in a fresh look with large format images and a clear menu navigation.The highlight: Under the heading “Applications” the viewers can choose from nine different industries and immediately receive an overview of the suitable machines. Thisway the company offers its customers initial useful advice already on the website, which leads to the appropriate, custom-tailored machine in the next step. User friendliness is the magic word when designing a website. The readers should feel addressed at first sight and find all information quickly and simply through clear menu navigation. Schwarze-Robitec achieves this clarity through perfect interaction of products and their industrial application. In addition, large pictures provide more vividness. Matching icons as well as category filters simplify navigation through the machine range. Of course the page also has a so-called Responsive Design. That means: the replay adjusts optimally to all terminal equipment and screen sizes. The readers also have the option of subscribing to the Schwarze-Robitec Newsletter InfoPipline and so always obtaining the latest information. Convince yourself at: www.schwarze-robitec.com.